You’ll then click on the type of Experience you want to create: Scratch-It, Zip-It, Peel-It, Slide-It, Pull-It, Push-it, Tear-it, Spin-it or Smash-it. A dialogue box will appear where you can name your Experience. The first piece of the Experience Page is the layout, where you can upload a logo and background image. 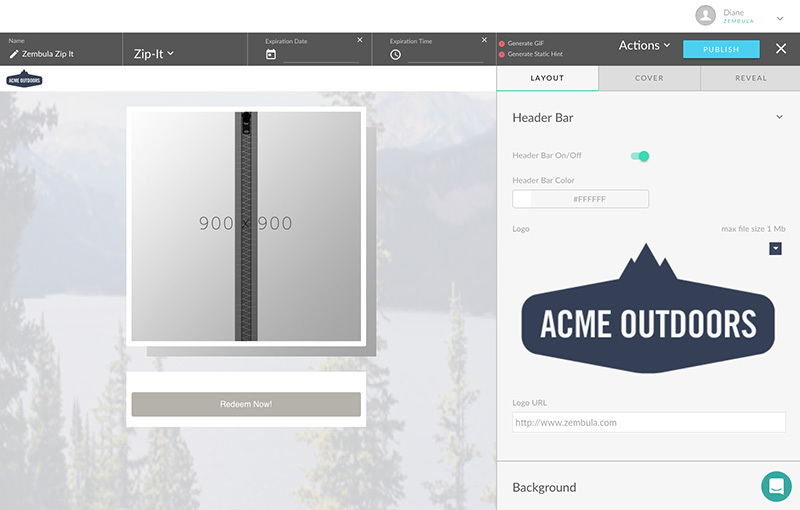 Note: The header and background are only visible if you are using the Zembula interstitial page. If you are embedding on your website, you will not need to use this feature. You have the option of uploading your logo and attaching a URL to it. Anyone who clicks on the logo of your experience page will be redirected to this URL. 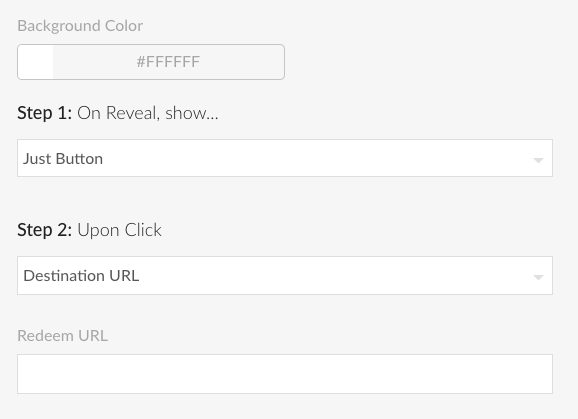 You also have the option to set the color and transparency of your header. If you desire a customized background , you can upload a 1400px by 900px image, or select a custom color. 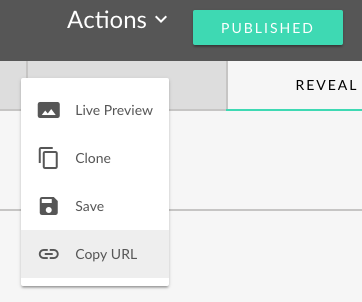 The Cover Image will be the first image users see when landing on your Experience page. Simply upload a 900x900px image by dragging and dropping it into the area indicated or clicking the "+" sign and navigating to it. 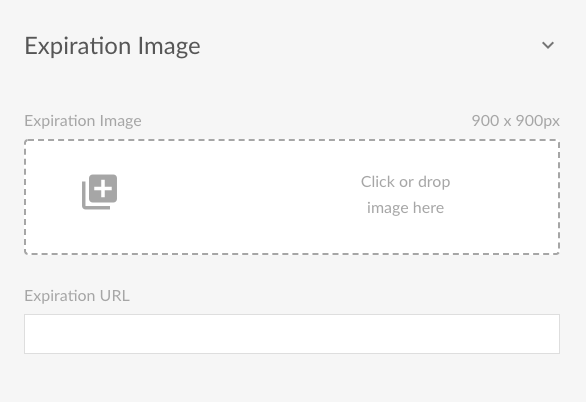 You have the option to upload a custom expiration image for use if you decide to expire your experience. You can learn more about custom expiration images here. 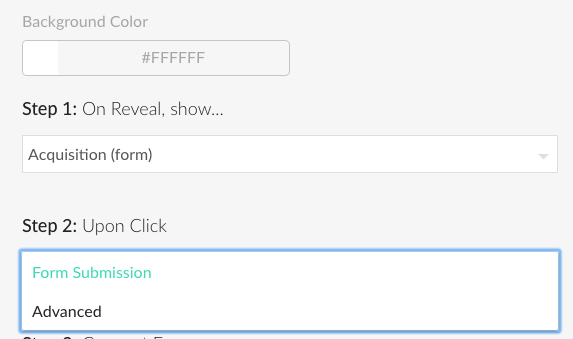 Each experience type offers its own hint customizations. You can customize color, transparency and placement of the hints for all experience types. 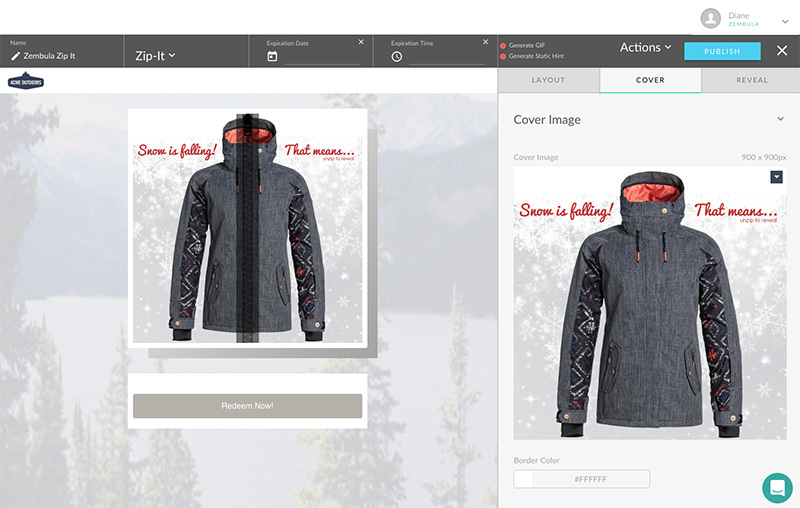 The Reveal image tab is where you will import your reveal image – what your audience will see after interacting with the cover image. Again, upload a 900x900px image to this area. Underneath the Reveal Image is the Settings Tab. This is where you will control the functionality of your experience's call to action (CTA). You have the option to turn the CTA button on or off, depending on if you want your viewer to take action after interacting or not. This is where you will decide what you want to have happen once the viewer finishes interacting. The selection you make in Step 1 determines the choices for the settings that follow. When you select Just Button, the options for Step 2 will be either Destination URL, which will send your user to a specified page that you input into the field below or Print Deal, which will open up a print window to be able to print the deal out. When you select Redeem Code, again the options for Step 2 will be either Destination URL, or Print Deal. 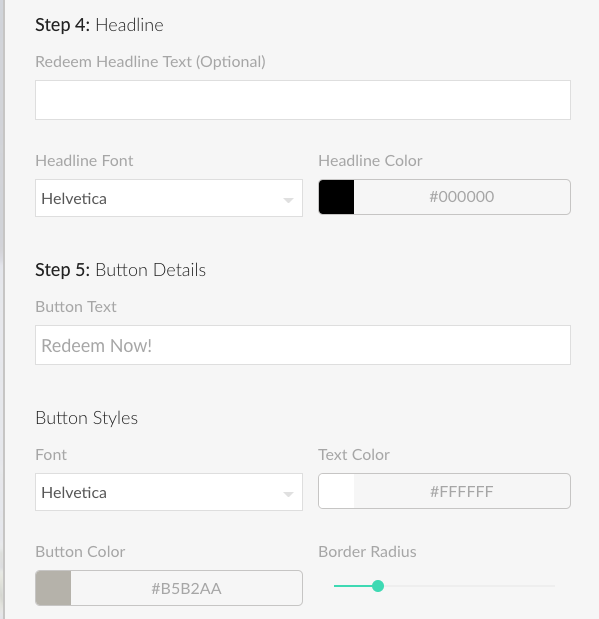 You will set the Redeem Code in the space provided under Step 3, and you can customize the color and font. 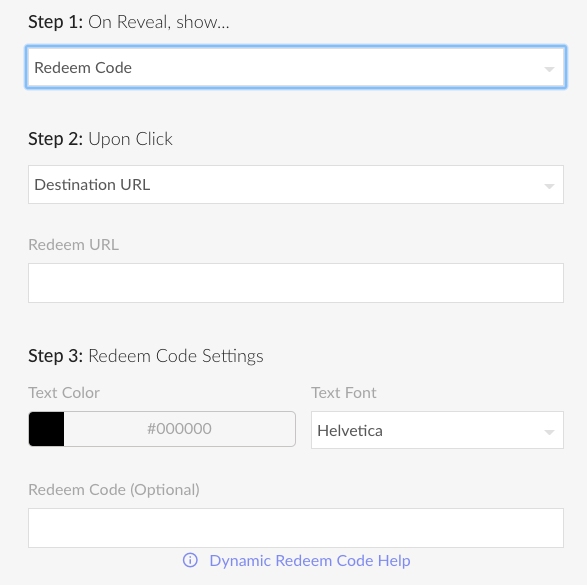 For more information about how to set up dynamic redeem codes, click here. If you want to use your experience to collect email addresses, you would select Acquisition (form). The two options available are to submit the form once the CTA is clicked, or, if you have access to a developer, you can customize the button function by selecting Advanced. Here is some additional information about advanced customizations. First, you'll want to select the name of the ESP you have your form set up with. Next, you'll see a list of all connected accounts associated with your ESP integration. Select the one that you want to send your collected emails to. Then, you'll want to specify the list where you want to collect your emails within your ESP. 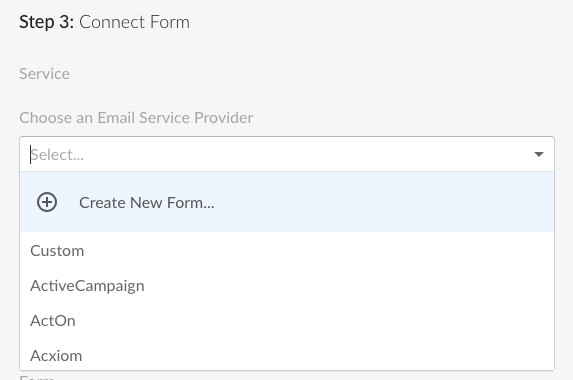 More about email acquisition forms and integrations can be found here. 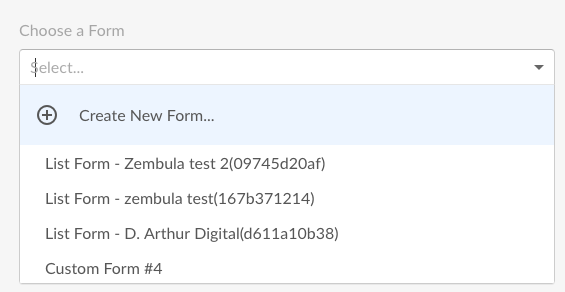 After you've determined the behavior of your CTA button, then you can customize it with an optional headline. 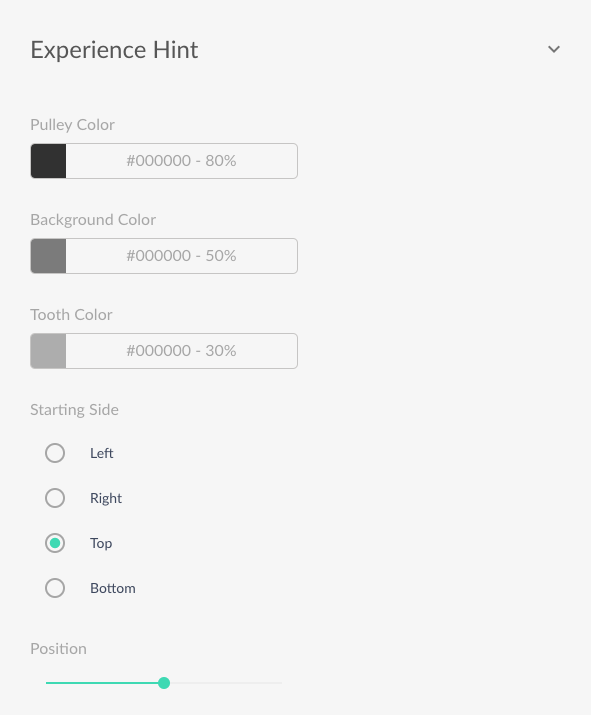 You can also customize the font, text color, button color, and border radius on the button itself. You have the option to add in terms and conditions pertinent to the deal you are offering. 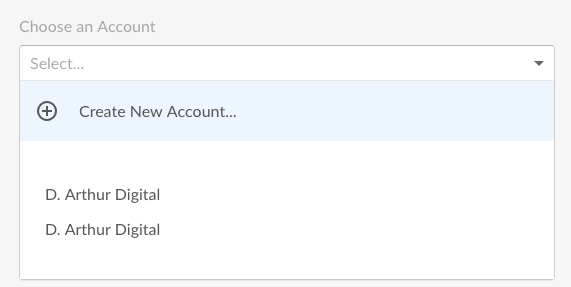 You can decide to have them appear in a modal window, or link to an external page. At the top of the experience editor, you have a menu bar with several different controls: the name of your experience, the type of experience, the expiration date and expiration time. You also have the option to choose a static or animated hint for your experience. 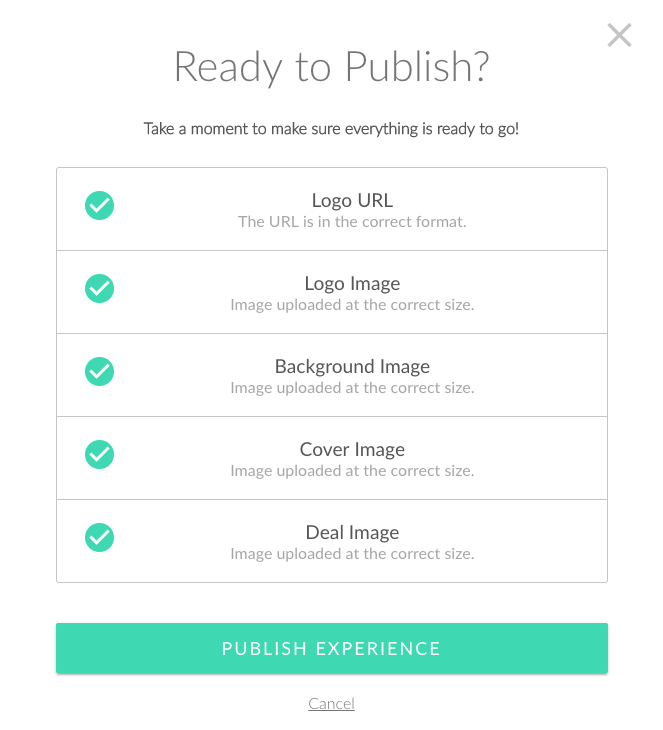 You will also notice a blue “publish” button which you will click when you are ready to publish. Then, paste the URL into a new browser window and voila! Your Experience Page is ready to view. You can edit your experience any time after it is published, and those changes will be updated automatically wherever your experience is shared.